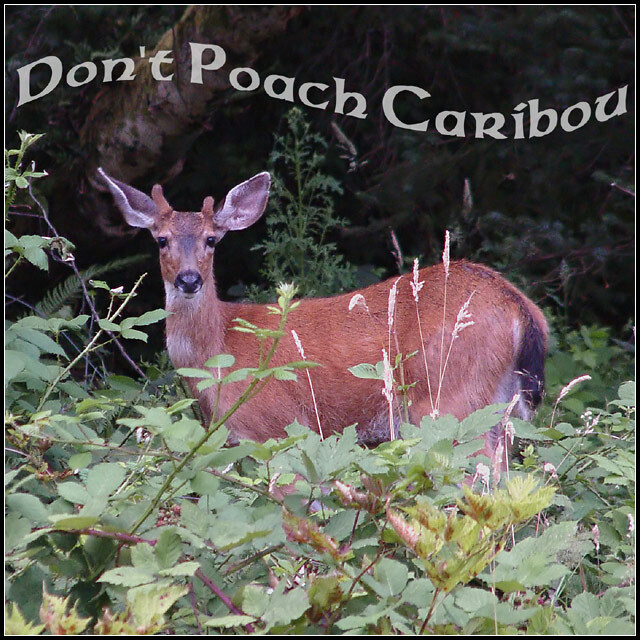 Hopefully caribou is close enough to deer, and hopefully people would think that someone would name a band "Don't Poach Caribou." Seems more like an animal activist poster. But [it] here goes. Crop, Levels, B&C, Color Balance, Saturation, Neat Image, Text, image size, sharpening, border. I think the reason you were voted down in this challenge was the fact that this is an image of a Deer not a Caribou and even though there is a similarity, people tend to get a bit picky. Your image itself is very nice. Good focus and detail with the animal looking straight at you How did you get so close? Nice image - good exposure and composition. Don;t care for the way yuou've added the text. Well done. Must've been tough sneaking up on this one to get the shot! Album cover or environmental statement? The image has a beautiful "flat" light. The subject is pushed forward well by the dark background. The text sits well balanced across the top. seems a little blueish. one of the more creative titles. it's a nice enough picture, but i would expect to see it on a cross-stitch pattern, hardly ever on an albumcover. It all looks a bit pink. Did you meant it to, or was your white balance just a bit off? Proudly hosted by Sargasso Networks. Current Server Time: 04/20/2019 02:44:11 PM EDT.